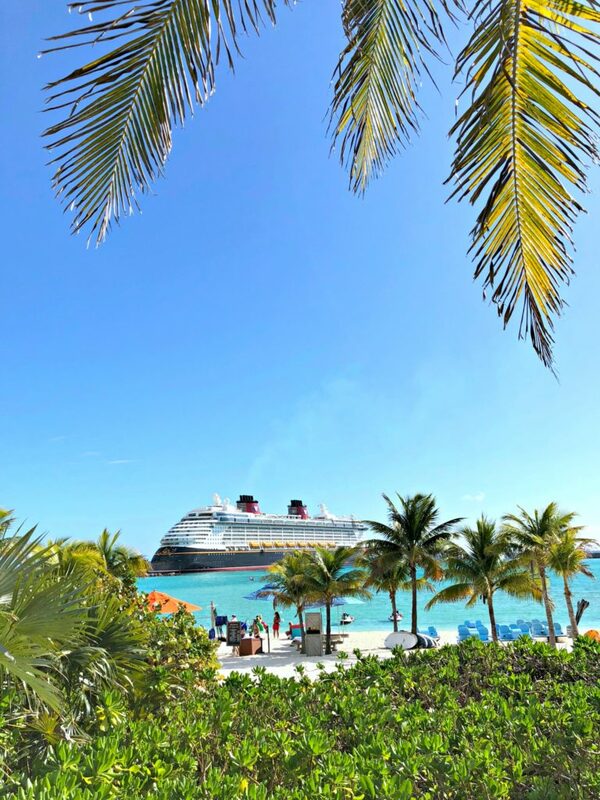 Make the Most of Your Time at Serenity Bay at Disney Castaway Cay! 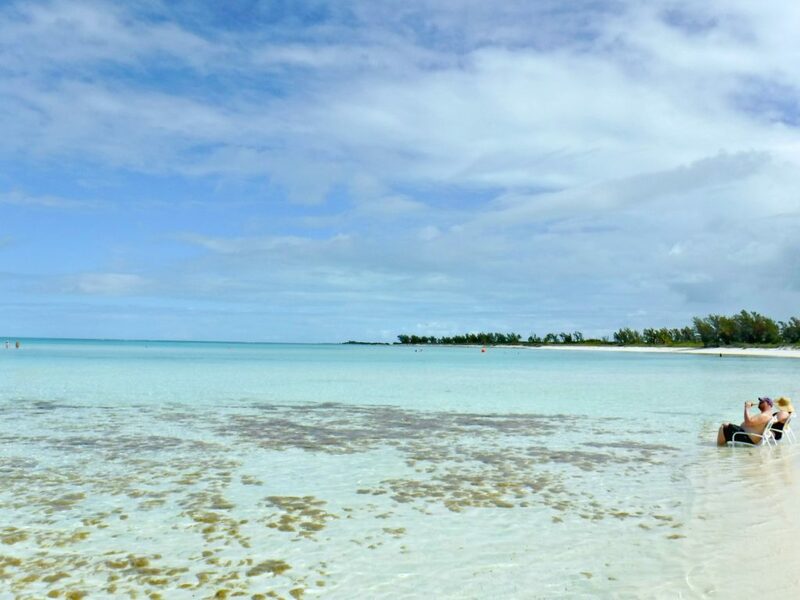 Serenity Bay is the gorgeous adults-only beach on the island of Castaway Cay. 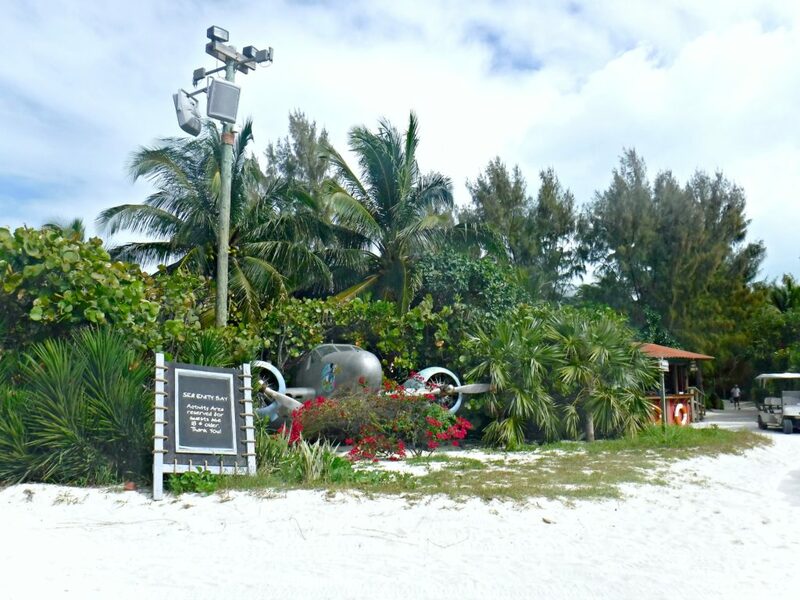 You will stop at Castaway Cay when you take any Disney cruise. This serene beach is for anyone who is eighteen years of age or older. It can be found at the end of the island away from the rest of the hustle and bustle. 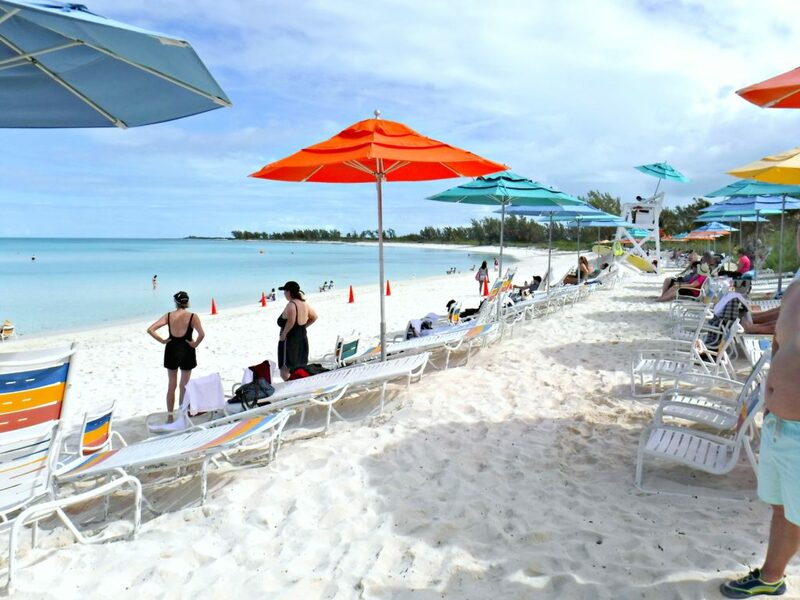 When you port at Castaway Cay, you have lots of options of where to spend your time. 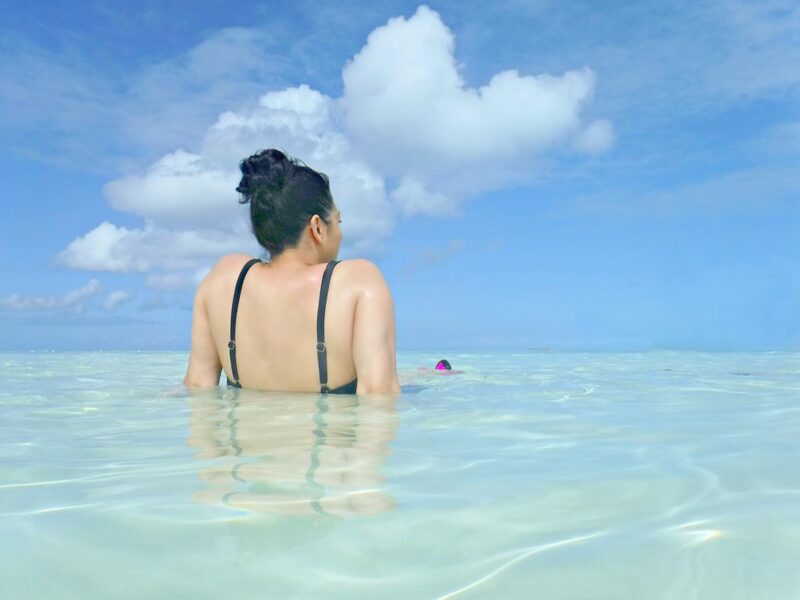 If you’re looking for pure relaxation, making some time for Serenity Bay is a definite must. You won’t need to worry about arriving at this beach early in the day if you don’t want to. Since the number of people at Serenity Bay is a lot less in comparison to the family beach, you’ll be fine. So go ahead, you can sleep in a little bit from the late night you may have had. There are plenty of lounge chairs and sand chairs, so you will find the perfect spot even if you arrive late in the morning. It can be a long walk to this beach, so if you do not want to do that, you can hop on the tram that will get you there within a couple of minutes. Depending on the time, the lines for the tram can be long. You might be waiting longer than it would take you to walk the distance. Having that option makes the island experience better. We arrived at Serenity Bay to a quiet and fairly empty beach. Same beautiful cerulean waters but, a lot less noise and traffic. The first thing we did was find a couple chairs to leave our bags on and we headed to the water. I loved that we didn’t have to hunt for chairs, there were plenty open and available. 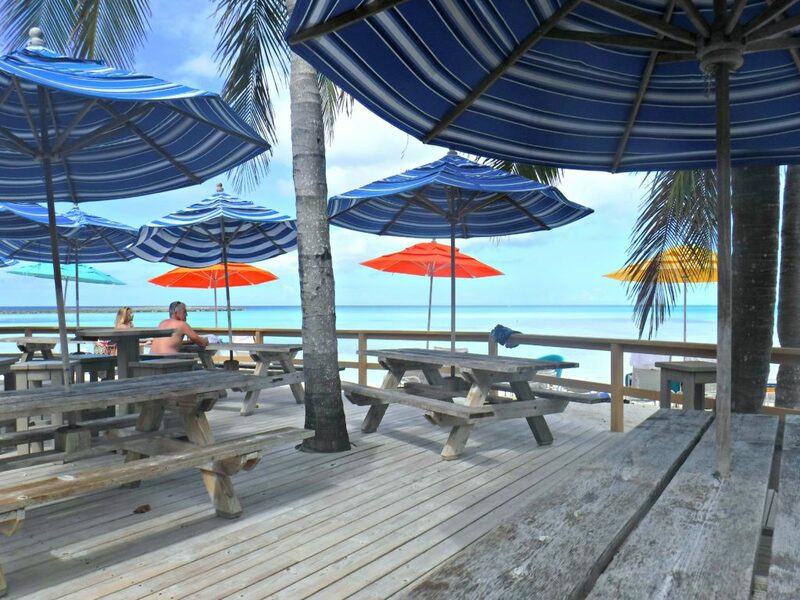 While spending time on this beach, you can enjoy delicious libations without even having to move off your chair. Servers walk around with cocktail menus all day long and you can place an order right from your chair. TIP: You NEED to eat a spicy chicken sandwich at Cookies Too BBQ. When it comes to the food though, you will need to move a little bit, but not that far. There is Cookies BBQ, Cookies Too BBQ, and the Serenity Bay BBQ. As well as Conched Out Bar and more. You’ll find the Air Bar and the Serenity Bay BBQ at this end of the island. You won’t need to even think about going back to where all the families are and the main BBQ. Instead, you can enjoy the food right there on the adult beach, and truth be told, it is usually better there because there are fewer people. TIP: Try the Konk Cooler at any of the bars or server, it’s AMAZING. This time, we headed back to the family beach area because we had been gifted an Adventure Package. It includes snorkeling and gear, biking, and floaties for the day. Our plan was to grab lunch and hit up the Snorkelling Lagoon. We decided to catch lunch at Cookies Too BBQ for this reason and because they have the spicy chicken sandwich. If you love spicy food, you absolutely need to try it. I crave it all the time and wish I could have it all the time. Too bad it’s thousands of miles away, huh? Apart from food, they have unlimited sodas, water, ice cream (chocolate, vanilla, strawberry, banana) and a wide array of food. 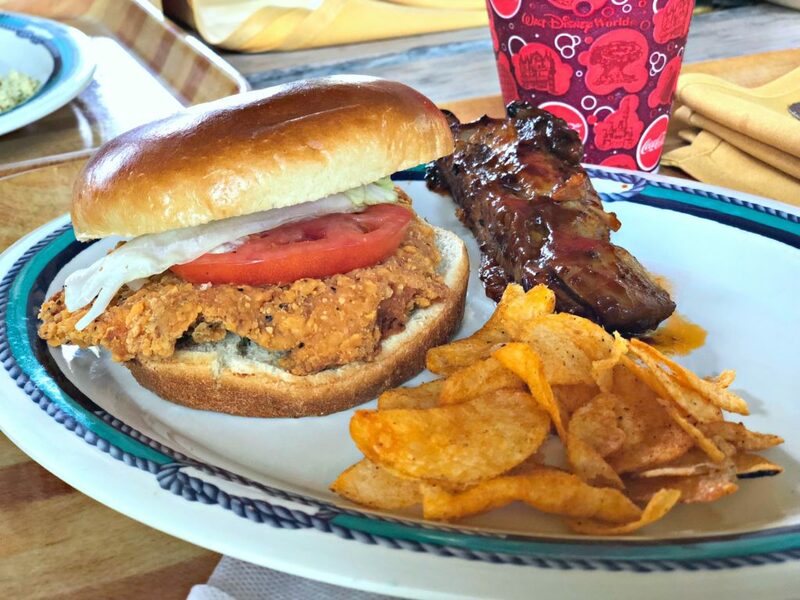 There’s Cajun chicken, salads (potato, tomato and onion, couscous), hamburgers, hotdogs, baked beans, sauerkraut, BBQ ribs, corn on the cob, vegetarian chili, chocolate chip cookies, banana bread, fruit salad, and Lays chips. Let’s just say, it’s delicious and you can enjoy as much or as little as you want. You won’t need to spend your time on the sand all day when you are at Serenity Bay. You can relax and rent floats and tubes for your water adventures. The best part of these rentals is that you can swap them out during the day and at Serenity Bay, they had an abundance. Therefore, if you are tubing in the morning, you can switch to a float for some sunbathing for the afternoon. One of the perks of Serenity Bay is that it is less crowded. That means there is plenty of space to lay about in the water or in a chair. 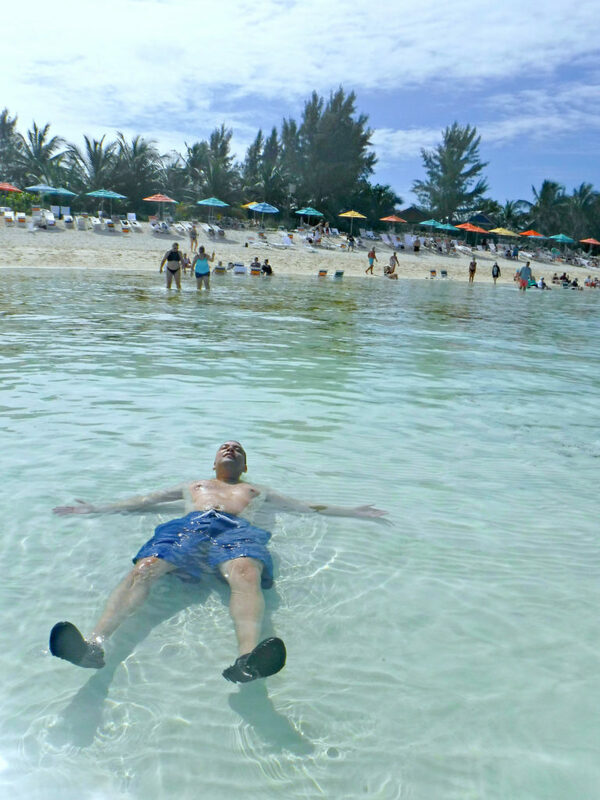 The water at Serenity Bay at Disney’s Castaway Cay is more shallow than the family beach. You can go out pretty far. If you’re looking to lounge in the water or sit in a chair for most of your day, you’ll love your visit at Serenity Bay. Don’t forget to take advantage of your servers for dranks! If you are looking for a way to fit even more relaxation into your day, without giving up your view of the water and the sand, you can schedule a massage in an open cabana. You’ll love Senses Spa‘s oceanfront cabanas. It will be just like a fabulous spa treatment on the ship, but with the warm ocean Bahamian breeze in the air. 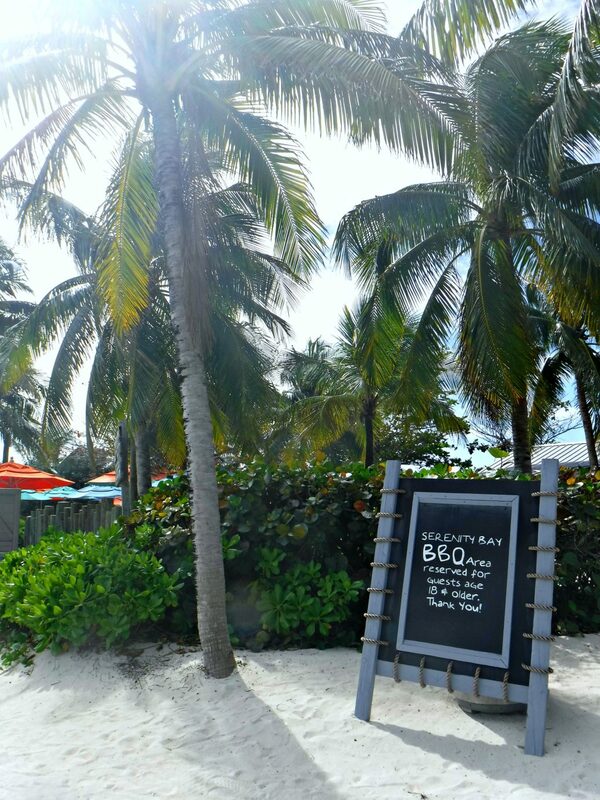 Even if you’re traveling with kids, you can still enjoy Serenity Bay. Castaway Cay has a children’s club that is incredibly fun. Specifically for children ages 3 through 12. 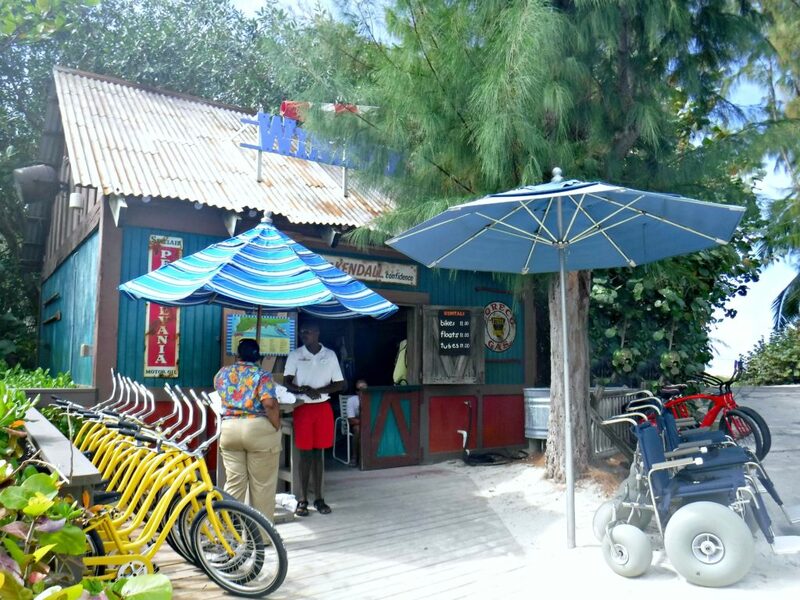 Disney counselors are available at Scuttle’s Cove, an on-island kid’s club. Plus, there is a teens area that, Teen Hideout, that can be enjoyed by kids aged 13-17. 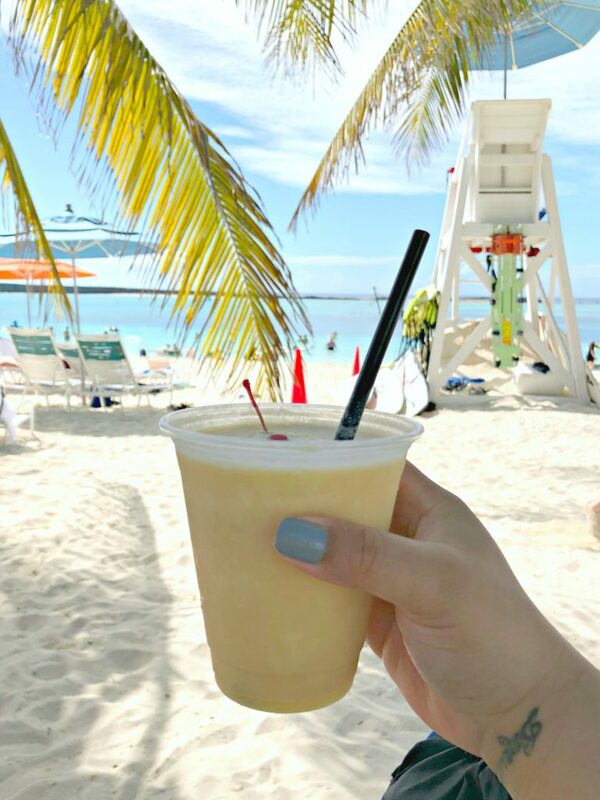 Even if you don’t spend your entire time at Serenity Bay, you’ll find that there is a lot to do at Castaway Cay for adults. Now, you’re ready for solo time. Not everyone can spend all day at Serenity Bay, but these tips and tricks will ensure that you are there at the times when it matters the most. If you aren’t sure that a Disney Cruise is for adults, check out these 7 reasons why you’ll enjoy any Disney Cruise. To book your cruise, visit Disney Cruise Lines! What would you do if you had a day in Serenity Bay? You just have to go if you can! Yes, doing nothing works for me. Looks like a great get a away. Perfect place to enjoy the water, sand and relaxing on the beach with a drink in hand. If I had a day on Serenity Bay. I would relax, enjoy the good eats and cocktails. Looks like the perfect trip. It really is a great vacation. It reminds me of the beaches here. You can definitely enjoy a scenic day at Serenity Bay. You can really recharge with sites like these. I would do it just like you. The whole day at the beach, taking in the food and drinks and loving life! Yep, for me, that is so relaxing. Serenity Bay looks so beautiful and inviting. I would love to go on a vacation here with the family. I bet the kids would have a blast. OK so from now on I’m definitely going on vacation with you all! You know how to have fun and relax all the same time. This looks like it was a blast. Hehe, you are more than welcome to! Oh man, if I were here, I’d probably relax with a good book and go shopping. And eat. And drink. It would be pure bliss. Yes, it truly would be. I am perfectly okay with laying in the sun all day. The sunshine always feels so good and I can’t wait until summertime so that we can spend our days at the swimming pool. So good, still think about it. YUM. I have wanted to go on a Disney Cruise for years now. I’d love a day there, it sounds so relaxing, and welcomingly warm after the cold winter we’ve had. Yes, it has been way too cold. This looks like the best place to get away from it all and just enjoy the best beach time. I have my kids usually but if we are not with them then this seems like the way to relax. I would love to go there! I know my kids would love it and it even looks relaxing for us adults. Yes, the kids have clubs or you can go to the family beach. This one is STRICTLY for adults. Wow I would love to experience the beauty that is Serenity Bay! I have never been to Disney and am now convinced I need to make it happen. Yes, you need to make this happen. When are you booking your cruise? The water is so blue! I love it. Seems like there are so many things to do. wow.. this place looks amazing! I love clear blue sea water and white sand! Yes, you and me both. Sounds like my kind of place! I love that you get to enjoy the beach and drink some cocktails without having to move! Can’t complain about the view as well. I would certainly enjoy a Disney Cruise by myself or with a friend. Disney has the best cruises no matter what age someone is. Thank you for the tips. We are looking forward to taking a family Disney cruise! Beautiful pics – I want to go! Looks like a relax getaway. Thanks, yes you have to go! 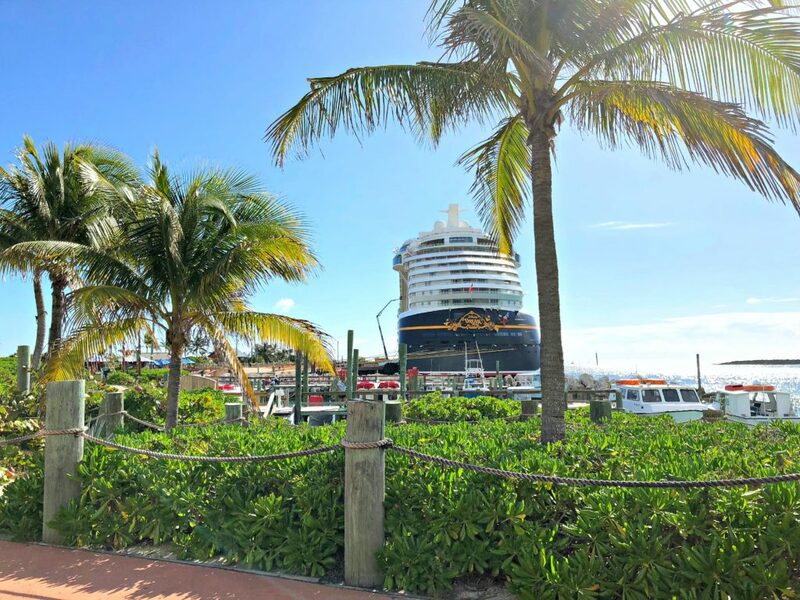 I have never been to Serenity Bay at Disney Castaway Cay, but your post makes me want to drop everything and get there, Great tips and pics. An adult getaway is always so much fun! Awesome, hope you can soon! Oh goodness. That looks like a slice of paradise! I wish I could just teleport myself there and enjoy some warm sun and relax in that clear blue water! We have not been on a Disney cruise yet, but I will make sure we do this year! Yes, I wish we could teleport there. I think if I ever went to serenity bay, I would never leave. It looks amazing there and you guys look like you enjoyed yourselves. Thank you for sharing your trip with us. LOL, I never want to leave. That is on my Disney bucket list. Shockingly my Disney bucket list is just as long as my non-Disney bucket list. Oh my! This looks like a wonderful place to be. I’d love to take a trip there. Even the pictures relaxed me, I need a getaway. Thanks for sharing. My pleasure, hope you can get away Lavanda. Oh wow, indeed this place is a perfect one especially if you want to destress and be away with the busy life and have some time to breath and have your own serenity and solitary moment. We’ve done Disney many times but never one of their resorts or cruises. I would love to check out this one it looks so relaxing. Yes, it is an adult only beach. Cool, eh? What a desire to go to this wonderful place. I was enchanted by this color of water, simply magical! Very good!